Imagine looking at a compass to see that the red part of the needle that used to point north now swings in the opposite direction. It sounds scary but it’s also a real phenomenon that’s bound to happen. Geophysicists have long known that Earth’s magnetic field, which acts as a vital shield against harmful solar radiation, has flipped many times over the course of its history—most recently, 780,000 years ago—and some scientists believe we are overdue for another flip. 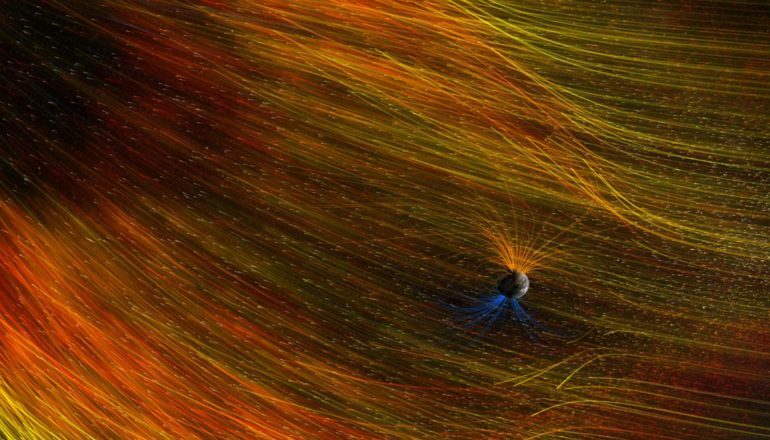 A new study makes predictions about the magnetic field with high confidence. Using all the paleomagnetic data available (recorded in rocks over the past 2 million years), the team produced a mathematical framework that accurately predicted all reversals during that time span and therefore allows for making realistic predictions into the future. The study appears in the journal Physics of Earth and Planetary Interiors. 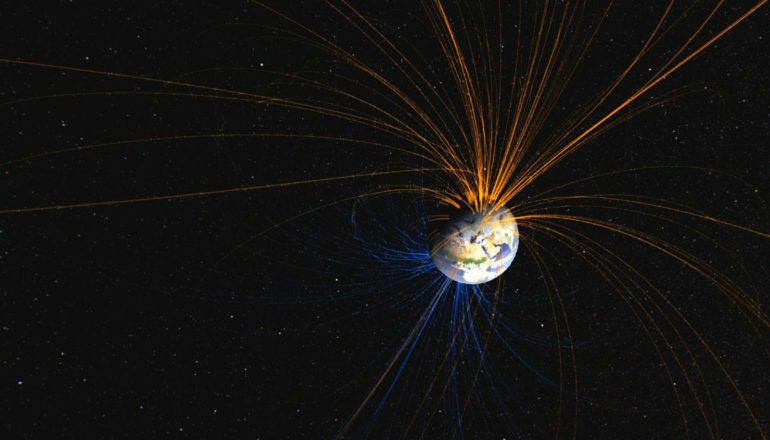 Because it is generated by very complicated flow of liquid metal in the planet’s core, Earth’s magnetic field is much more complicated than the image familiar from textbooks: one North Pole and one South Pole, with invisible field lines running between them. In reality, there are additional pole components, although those are much weaker than the two poles most of us are familiar with. According to current—and competing—theories, a switch in Earth’s field is imminent when it weakens below a certain threshold or if it decays rapidly in strength. Because the current field is strong, yet decaying rapidly, some scientists take this as an indication that a reversal is about to happen, while others maintain that the field is too strong to switch. Morzfeld’s team set out to find out which theory is more likely to be correct, by combining simplified mathematical models with geophysical data gathered by studying the magnetization of rocks. Rather than attempting to calculate the extremely complex processes underlying Earth’s magnetic field, Morzfeld and his coauthors used models simple enough to run on a laptop computer, and fed them data of the past 2 million years, which have seen seven. Because a realistic mathematical description of the processes of liquid metal flow that fuel the magnetic field would require millions of equations, no computer can compute a faithful representation of these processes over millions of years. But in order to be useful, mathematical models may not need to be that complicated. The team then put the models to the test using a technique called hindcasting. Of several models tested, one emerged as particularly simple and powerful, successfully predicting all magnetic field reversal events over the past 2 million years. The model uses three equations: one describing the dipole, one describing a non-dipole field and a third representing the effects of the flow inside the core. Interestingly, the researchers found no support for the existence of a proposed “point of no return,” a threshold of field strength acting as a trigger for field reversal. But with the help of their models, they did find reliable thresholds in terms of computed probabilities. On average, Earth has seen a reversal of its magnetic field every 250,000 years, although the in-between periods vary greatly. So when it finally happens, what should humans expect? The study was conducted in collaboration with Alexandre Fournier and Gauthier Hulot at the Institut de Physique du Globe de Paris and received partial funding from the University of Arizona’s Global Initiatives “International Research Development Grant” and by the National Science Foundation.